Maybe I am just a little biased, but I think that this is the best guacamole recipe that you will ever try. It is my most requested dish – and it is often my cover charge when we go places. No homemade guacamole? No admittance. Sheesh – friends. I have to say that making guacamole is pretty easy on the surface, you just mix everything together. But it really all comes down to taste. Remember that you are using all natural ingredients – so your red onion may be a little larger than necessary or the spicy pepper that you use may have more or less heat than you want. Mother Nature is funny that way. No two vegetables are exactly the same. So, as you make this quite healthy guacamole recipe, remember to take the time to taste it at each stage. What is guacamole? 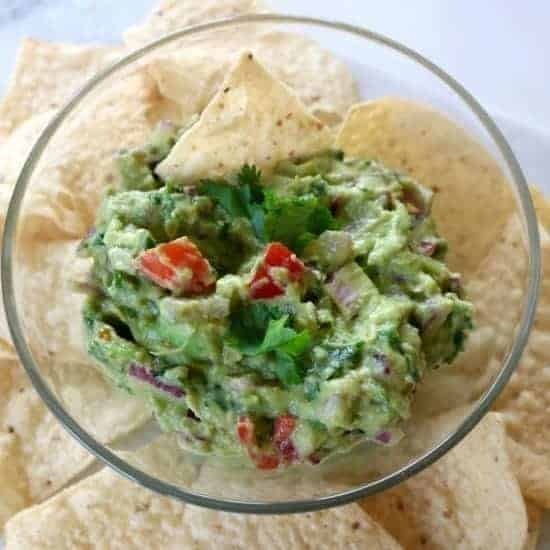 Well, for the most part, it is a dip made with mashed avocados that are mixed with lime, vegetables, and seasonings. You can make it your own by what you put in it. Cut the avocados in half, remove the pits, and spoon the flesh (that doesn't sound right, does it?) into a medium mixing bowl. Toss in 1/2 teaspoon of salt. Using a hand blender, like this one , mash the avocados, lime juice, and salt just a bit. I like a bold, chunky guacamole dip so I a mash them just enough to be able to scoop on a tortilla chip while still leaving pieces of avocado intact. Chop the onion, quarter the grape tomatoes, and dice up the long green chili and the cilantro. Using a spoon (NOT the hand blender) stir the vegetables into the avocado mixture. Garnish with a little cilantro and serve with tortilla chips. So, long green chilis – where the heck do you get these? Unfortunately, my grocery store does not carry them – so I get them at an ethnic grocer. If you use a chipotle pepper or a jalapeño pepper – be careful when handling and remember that the heat is in the seeds, so remove the seeds for less heat. Fresh peppers give the best flavor, so I would stay away from jarred or canned varieties. Depending on the size of the avocados that you use, you may want to adjust the quantity of the other vegetables and the amount of lime juice accordingly. You can always add more but you can't remove too ingredients once they are mixed in. I have tried a bunch of tricks, and some seem to work better than others. It is just my observation, but I think a lot depends on the ripeness of the avocados. When making and storing my best guacamole recipe, I have found that the guac browns faster if the avocados are really ripe and soft. If the avocados are on the firmer side (you don't want to use them if they are too hard), then the guacamole seems to stay green longer. choose a container that fits the amount of dip you are storing. A container that is too large allows in too much air and aids browning. take a sheet of plastic wrap and pat it down right on top of the guacamole – so there is no air. Then put the lid on over top the plastic wrap and the guacamole. 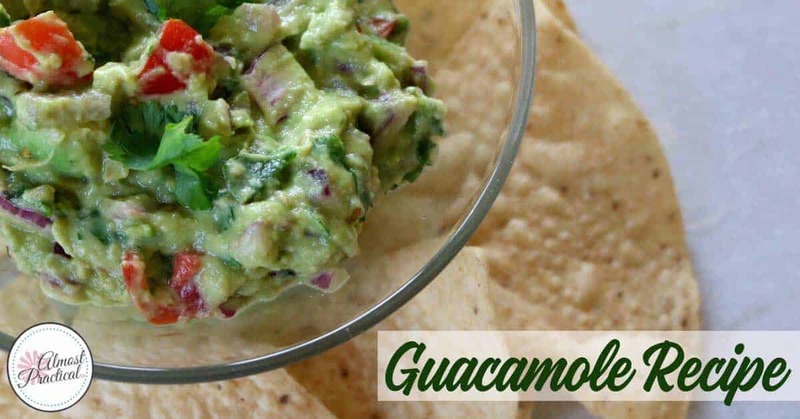 This guacamole recipe is perfect for all occasions – a Friday night snack, Super Bowl party appetizer, and of course, Cinco de Mayo. Print it out and keep it on hand for when you need it. Cut the avocados in half. Remove the pits and scoop the flesh into a medium mixing bowl. Chop the red onion, quarter the grape tomatoes, mince the cilantro, and chop up the long green chili (or other spicy pepper if you cannot find chilis). With a spoon (NOT the hand blender) stir the chopped vegetables into the avocado mixture. Stir until well combined. Garnish with fresh cilantro. Have a favorite guacamole ingredient to share? What is the secret ingredient in your best guacamole recipe?